Objects from the topsoil, including marbles, coins, clay pipe stems and bowls, glass, metal and ceramics. I've cheated a little here, the more complete clay pipe bowls aren't from my allotment, but are nevertheless typical finds. Every Autumn and Winter I dig my allotment. I enjoy digging simply from a physical point of view, but as an archaeologist I also find myself watching out for any artefacts that might appear in the turned-over soil. I began to collect the tiny fragments of pottery that caught my eye, and several hundred I picked up prove useful when, as part of my MA in Historical Archaeology, I had to analyse an artefact assemblage. I realised that these small fragments of evidence might tell me something about the people who lived nearby. In the past, archaeologists have routinely ignored topsoil, stripping it away and dumping it, unexamined, in their haste to reach the sealed and stratified deposits that might lie beneath it. Any finds from topsoil are usually lumped together as "unstratified" and, if anything, merely listed. Yet topsoil could be regarded as our biggest archaeological context. It is everywhere, and is easily accessible to everyone. Though this means that it is often (and usually) much-disturbed, it also means that it collects material that is discarded today and was discarded yesterday. However I decided that the fragments of pottery I was finding in the much-disturbed topsoil of my vegetable garden almost certainly originated in "night soil," human waste collected from the outdoor lavatories ("privies") of nearby communities and spread on fields as fertiliser. 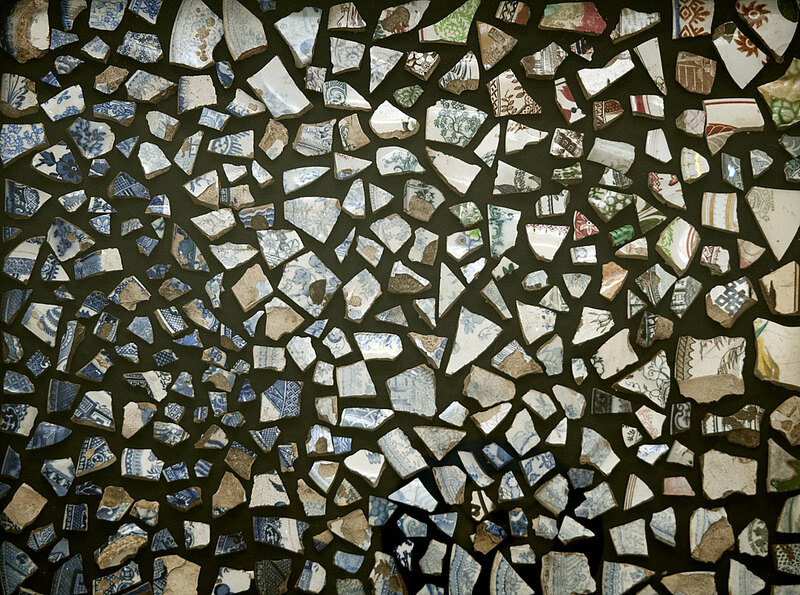 I could see almost immediately that sherds of plain white forms were signicantly outnumbered by pieces of colourfully-patterned wares, and that it seemed that light blue patterns were more common thatn dark blue and other colours. There were only one or two fragments of more highly decorated pictorial wares. Was this because they were more expensive, or better cared for? By itself, my collection of pottery fragments is a tiny sample of the Whitemoor allotments site. It would be good to enlarge this sample, both from Whitemoor and by adding data from other allotment sites. That is why I've created the Topsoil Project. Those who take part in the project simply have to collect every fragment of pottery they come across while digging their allotment. After a few seasons this will create a sample that can be analysed by colour and design. Participants can record finds as they go along, and I suggest building an image collection using a standard flatbed scanner. The only historical information required is the date when the allotment garden was created.The results can then be shared across the country, and any trends identified. A slide series introducing the project (includes pdf version). As part of a "doing historical archaeology" portfolio we were asked to examine and report on an artefact assemblege. Some of the artefacts I've found on my allotment. Decorated pottery from my allotment, ranging from C19th blue-on-white wares (bottom left) to browns (top right). I think I might hang this collage of C19th (mostly) material culture on my study wall!